One of the most amazing markets I have seen was the daily market that is set up on the train tracks just outside of Bangkok in Maeklong. Our family was in awe of the efficiency in which this elaborate fish and fresh food market was set up and put back at each passing train. 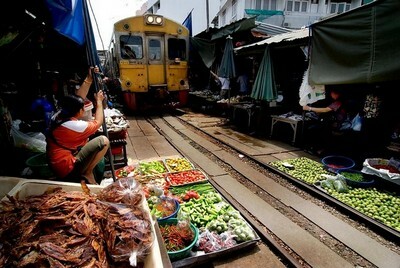 People wandered down the tracks shopping amongst the vendors but just before the train appears each market folds back or slides away to allow the train to pass and unload. As soon as it passes the market immediately emerges back into place and everything returns to business as usual. There are fresh vegetables, fruits and spices to tempt you. Eels and live fish splash in pans and a wide array of thai delicacies are available to enjoy. I am always amazed at the wealth of fresh food in some of the most poverty stricken areas of the world while in the USA we eat so much processed food and fresh food is so expensive. Markets are a great place to wander as a family. Meeting and talking with locals, discovering new foods and seeing how people earn a living is such a valuable experience. Part of the Buddhist religion is to practice “Punna” or the practice of doing a good deed. We bought some live fish at the railway market and released them back to the river as suggested by our local guide. A simple but beautiful act to make for a wonderful family experience. Love this place! Did you go to the floating market as well? Yes! My son did a funny video blog from there too! Amazing! Yep! I’ve heard of this amazing market just outside of Bangkok. Awesome post and video!